Vision plays a large role in how we interact with the world around us. According to a journal article from Frontiers in Psychology, "the primacy of vision is structurally embedded in cortical organization as about one-third of the cortical surface in primates is involved in visual processes." (Kupers et al, 2011) The loss of vision definitely has an impact on brain organization and the way that an individual interacts with the world around them. Scientists from the UCLA Department of Neurology have discovered that blindness causes structural changes in the brain. This indicates that that the brain might reorganize itself functionally in order to adapt to a loss in the sense of sight. (University of California-Los Angeles, 2009) Researchers found that the regions of the brain responsible for vision were smaller in blind individuals than sighted ones. However, in the blind, non-visual areas of the brain were found to be larger in the blind. Therefore, the other senses grow stronger. Researchers suggest that this is the result of blind individuals compensating for the areas usually used for vision. It appears that the brain compensates for the lack of sight and this is especially apparent in people who have been blind since birth. The brain has much more plasticity during this time, which allows much more development of the other senses. Individuals who are blind have other ways of seeing our world, such as reading with braille. The following video presents the challenges of raising a child who is blind and presents the way that a child will learn to adapt to their lack of sight. How Did They Find It Out? Using brain imaging, researchers examined individuals who have lost their sight at birth or before the age of five, people who have lost sight after 14 and individuals who still had their sight. They compared the groups and found that the loss and gain of brain matter depended on when the blindness originally occurred. (University of California-Los Angeles, 2009) In the group that was born blind or became blind before the age of 5, the brain showed difference from the other two groups in the corpus callosum, which is the area of the brain that transmits visual signals. It was found in both blind groups that they had enlargement in the areas not responsible for transmitting vision. The individuals without blindness that were tested did not show these enlargements in these areas of the brain. In the following video, Professor Brian Wandell of Stanford University tells the story of Mike May, a world-record holding skier that is blind and how he adapted and became who he is today. The video also shows brain scans of blind individuals and sighted individuals, which shows the contrast of how the world is perceived through both groups. The video presents many of the same ideas presented above. 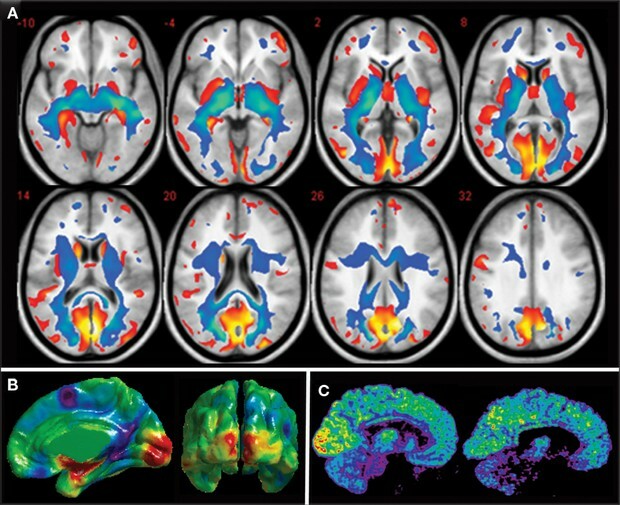 These brain scans come from a peer-reviewed journal article on the the nature of consciousness in the visually deprived brain.